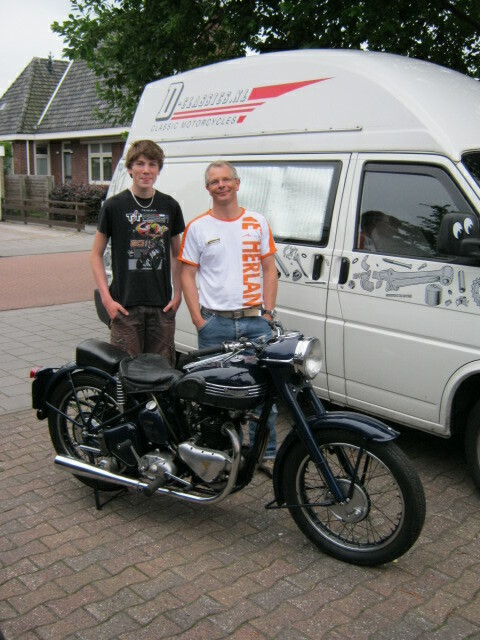 A while ago D-Classics bought a 1950 Triumph 3T in a strange blue colour. According to the last owner this colour should be the original. At home to our suprise we saw a familiar name on the old logbook: Loman in Assen. Frans Loman, with whome we rode classics races for some years, happened to be a son of him. 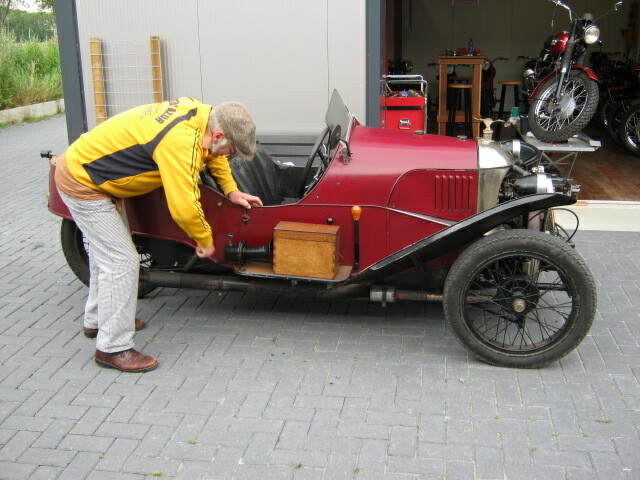 His father bought the 3T in 1955 from the Amsterdam police, so the strange colour was explained. Frans was very happy to hear that his fathers first motorcycle still existed and decided to buy the Triumph. For me it was really special to deliver the bike to its old adress after more than a half century. and i am really happy that i have been able to contribute to this reuniun. Due to beiing very busy, i don't allways have enough time to keep this site up-to-date. 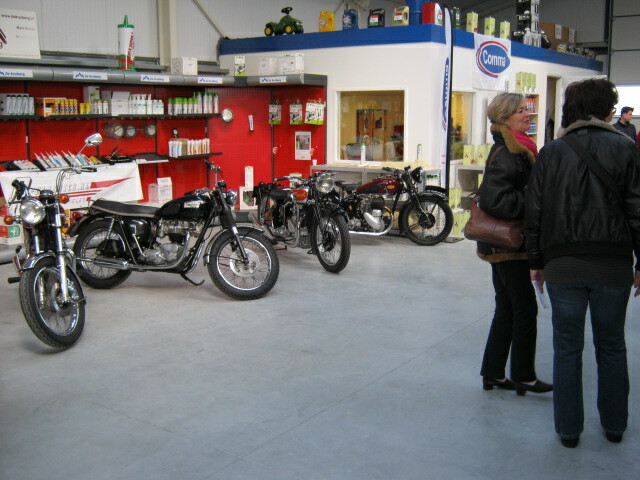 For an impression of the motorcycles D-Classics offers, please take a look at the 'column "sold". If you are searching a particular bike or have something to offer, please contact me by mail or telephone. On the 4th of may, D-Classics was at the English day in Kampen. We took a Rudge and an Eijsink. Thanks to the Zwervers for their hospitality and well organised day! 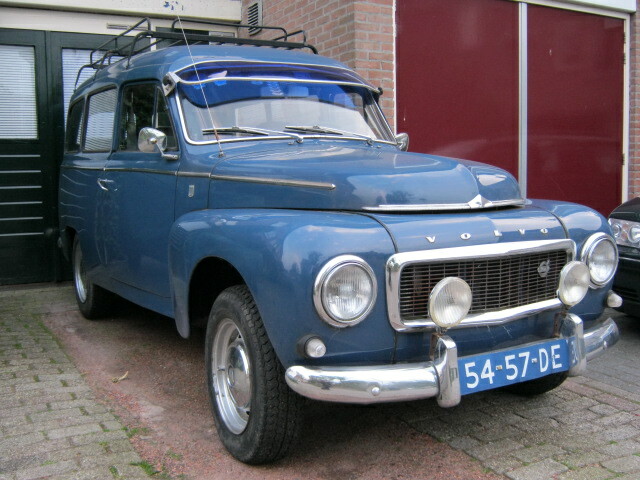 On the picture you see the new servicevan from D-Classics. Due to lack of time not all motorcycles are always shown on the site. So if you are looking for something special, please let us know. Last sunday, a combined MG-Triumph rally took place at "The Kruiberg Olie"in Bedum. Owner of de Kruiberg Mark Kruize also invited D-Classics to showw some classics we have for sale. It was really interesting to see a car rally once, also we could tell some interested people a little more about our classic motorcycles. 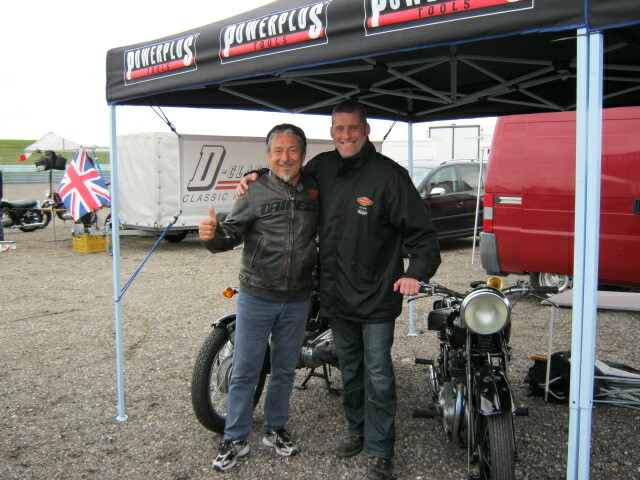 Thanks again to Mark for his hospitality, the interesting story he told about oils and the very well oranised morning. 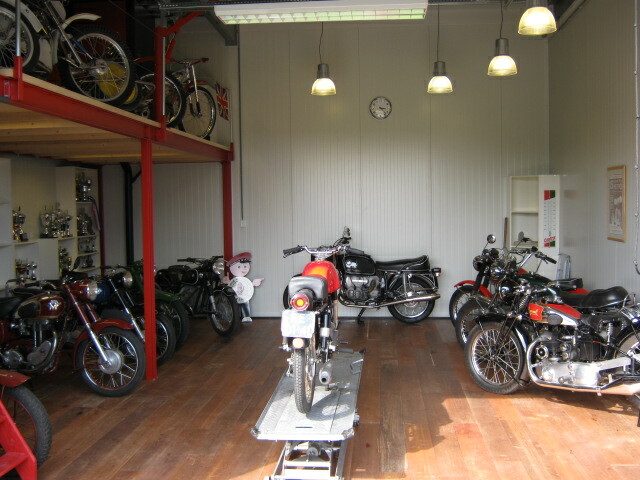 Because D-Classics is equipped for the transport of motorcycles and because we are often on the road in Holland and county´s around Holland, we can offer you to transport your motorcycles. So did you buy or sell a motorcycle and you don´t have the time or possibilty to transport it, please contact us. 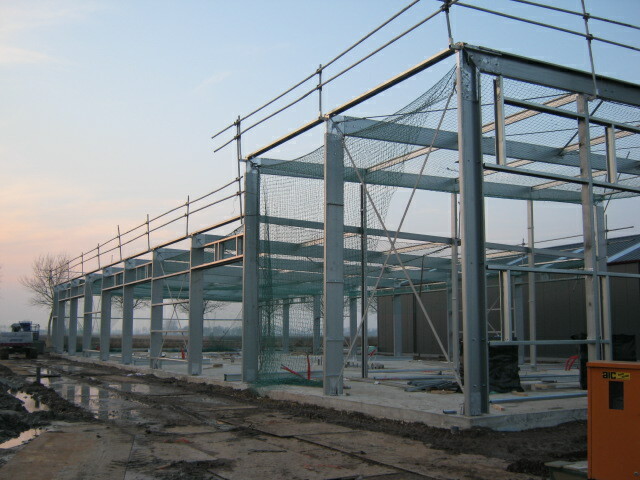 Except fot the transport, we can also arrange all paperwork or even the payment for you. -Heinkel 103 A-2 1961 in very nice condition and with many accessoiries. -Triumph 3TA 1967 ex Dutch army, totaly restored as a civil version. Because of the lack of time not all bikes are allways shown on the site. If you are looking for a certain mark or type of motorcycle, please let us know so we can let you know if we expect something. 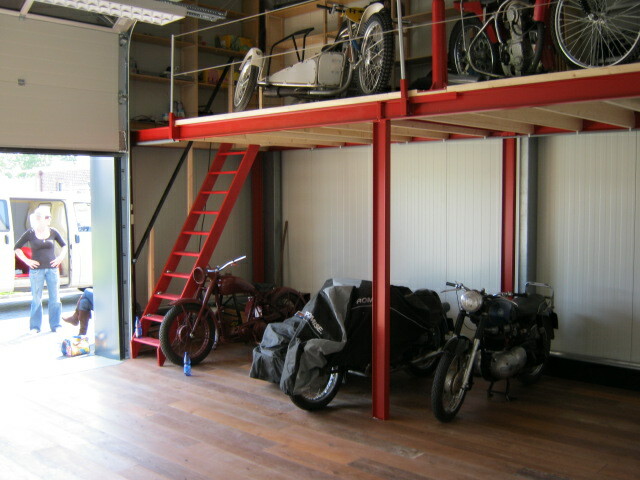 Meanwhile the unit in Bedum starts looking more and more like a real motorcycle shop. It is not ready yet, but the bikes are allready there. 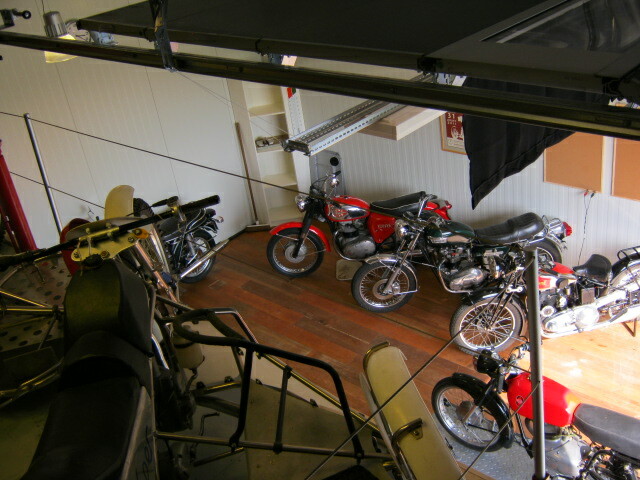 Because of the goos sales the last weeks, we are looking for good classic motorcycles. If you would like to sell your bike, dont hesitate to contact us, we guarantee you a correct dispatch. 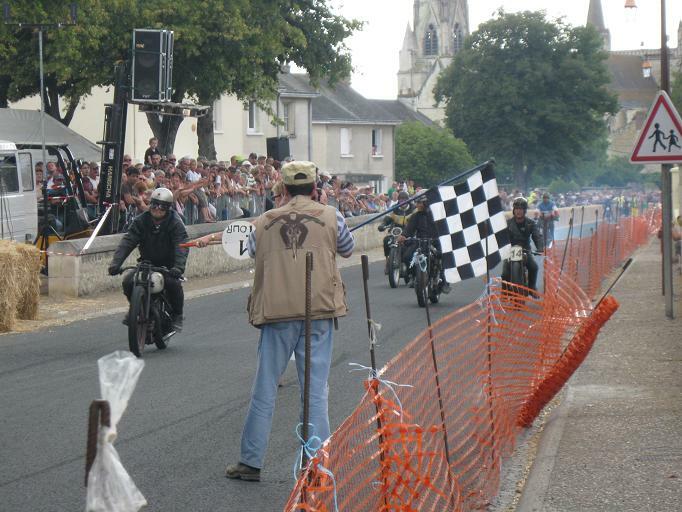 Hollydays are over now, we combined delivery of some bikes to France with riding a classic race there. 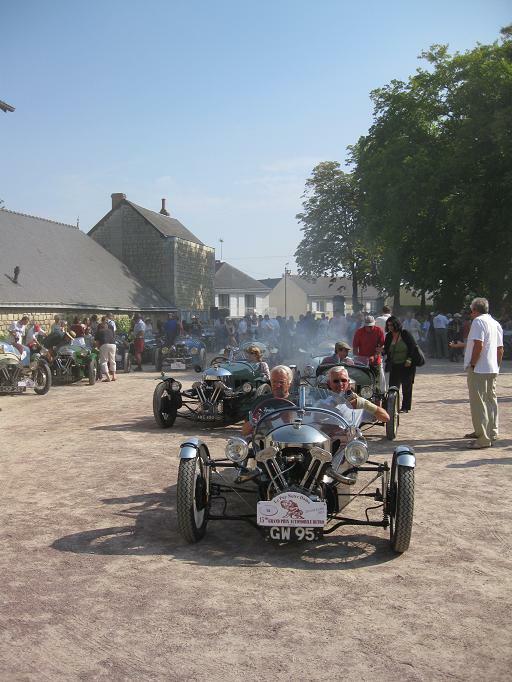 In the mid-French Puy de Notre Dame Rik rode with the Rudge in an event specialy for pre-war bikes and cars. 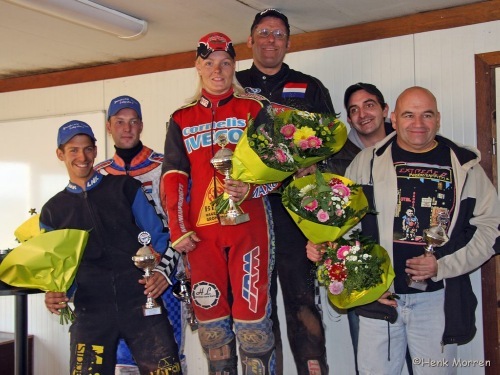 It was a great experience, with cars and bikes that are very rarely being raced around here in Holland.Top of the bill was a race special for 3-wheel cars, some 40 tricycles like Morgans, Darmonts and Sanfords where being ridden. Together with the great French atmospher and hospitality this gave us a fantastic weekend. 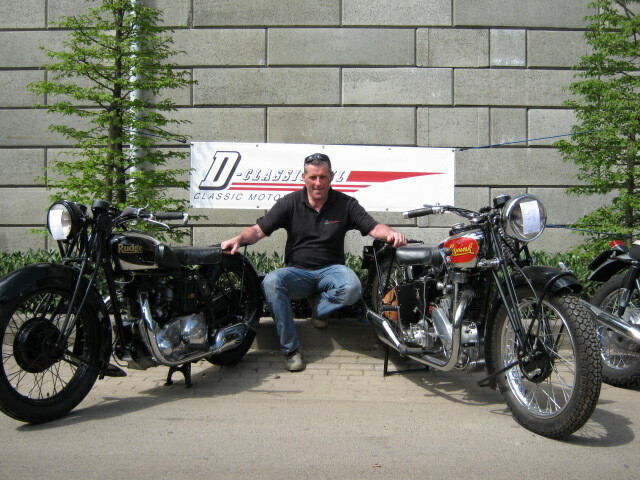 Because of the good sales last weeks D-Classics is looking for nice classic motorcycles for sale. If you would like to sell yours please contact us. 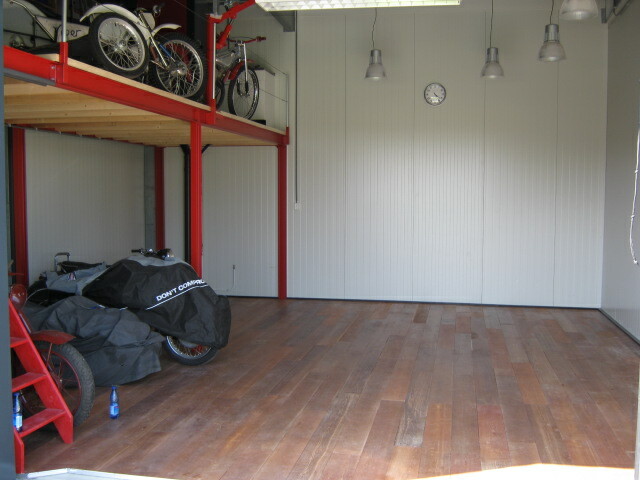 Meanwhile work at the unit in Bedum commences well, the first bikes are there allready. 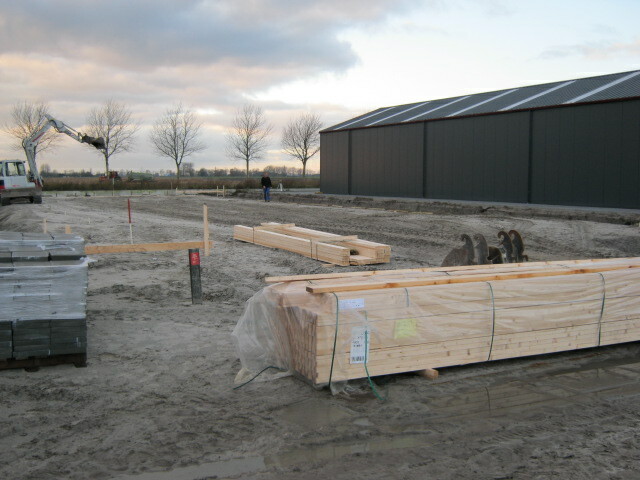 Here a few pic's to show how it is going to be. The little movie in wich a Triumph Tiger 100, from D-Classics plays one of the main roles, will be broadcasted at OOG TV from 1st of July 17.00 PM. Also take a look at www.oogtv.nl at the program "Kunzt"
Soon here, a Triumph 3TA '66 this time an army model that has been converted to civil specs (lots of work done on it) And a T140V Bonny from '77 in very beautifull condtion. 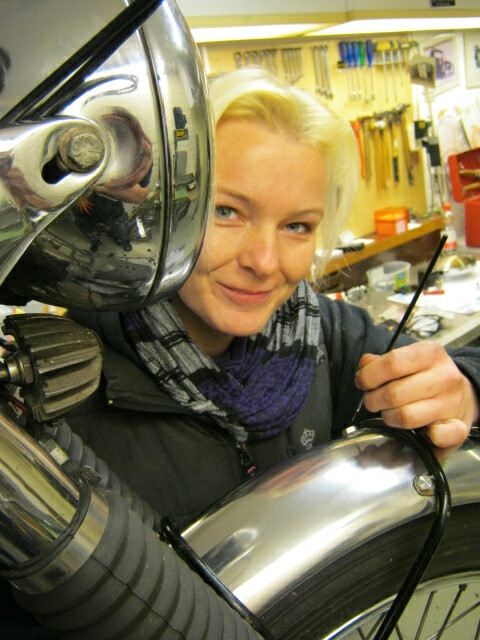 Soon here; very beautiful AJS Model 16 from 1953 with Dutch registration. Soon here AJS Model 8 from 1960, for restauation very complete and original. 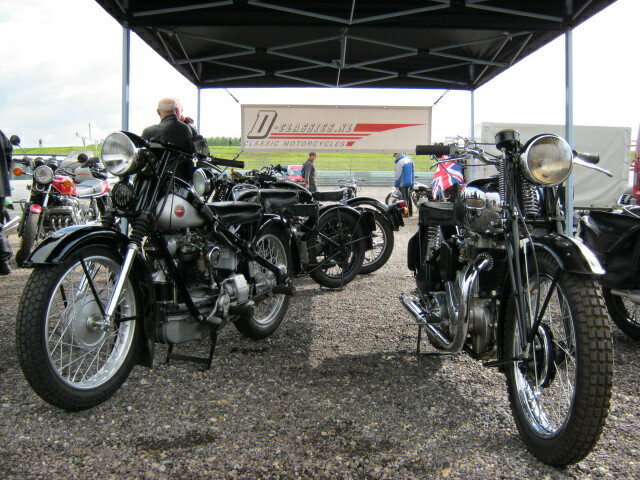 Soon here; 2 BMW's in good condition; one R60/5 and one R75/5. 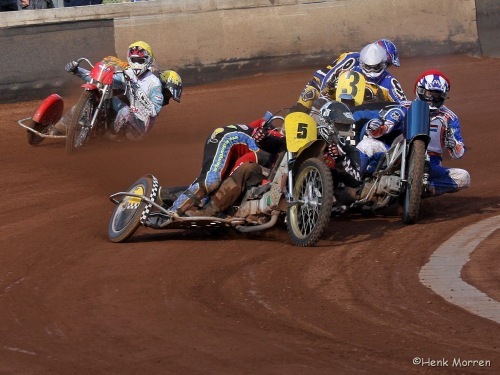 D-Classics will also be present at the National Sidecar Day. 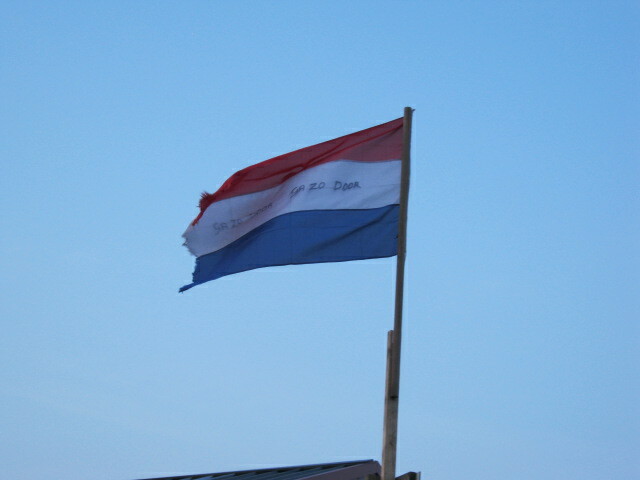 It will take place at the Military Airpane Museum in Soesterberg on 15 th of May. Soon here; Rudge Whitworth 500cc fourvalve, model Special from 1933. Bike is complete in parts, so for restauration. 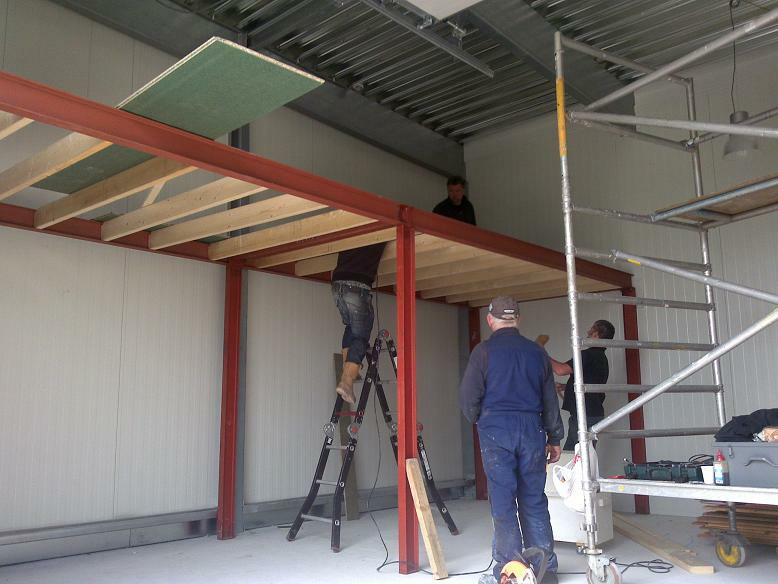 Constuction of the new unit has been started again, sadly building had been stopped a while because of the low temperatures, but as planed it will be ready end of March. Because of de good sales D-Classics is always looking for good Classics, if you have a classic or veteran motorcycle that you might want to sell, don't hesitate to contact us. We garantee a correct settlement! From now on this site can also be viewed in English. As you can see! Last weekend D-Classics was present at the Centennial Classic TT on the TT Ciruit at Assen. Allthough the weather was not too good, we could welcome a lot of people at our stand. Famous ex-rider Marco Lucchinelli also showed op to give a look at the bikes we took, according to his reaction he liked them! 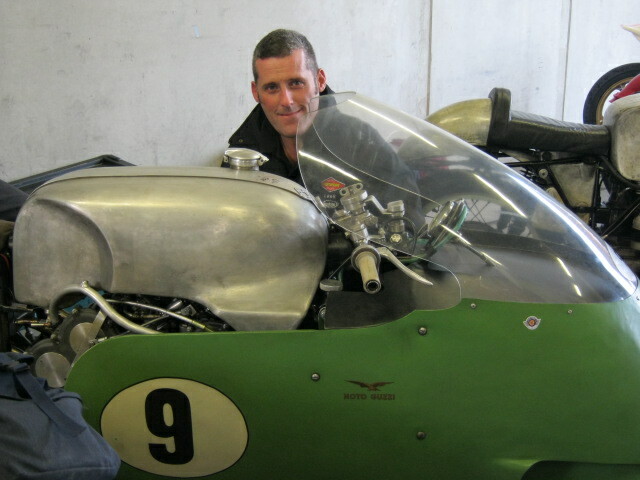 Offcourse we took the chanche to see a lot of famous riders and machines at the pits, very impressive!! 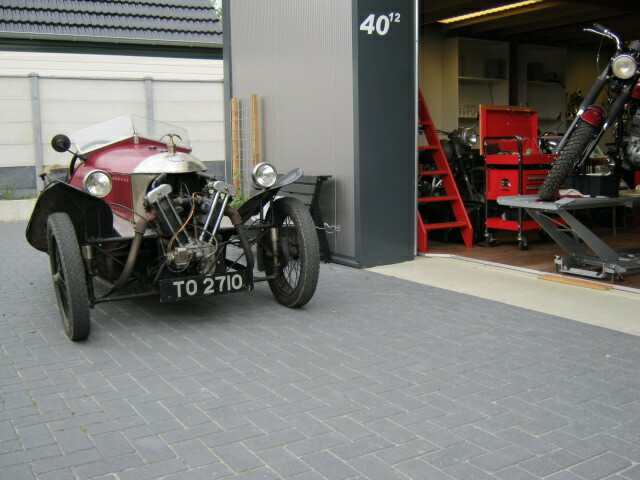 Will arrive shortly; 2 prewar Ariels, one Red Hunter 350cc and one 550cc sidevalve from 1932. Keep an eye on this site! 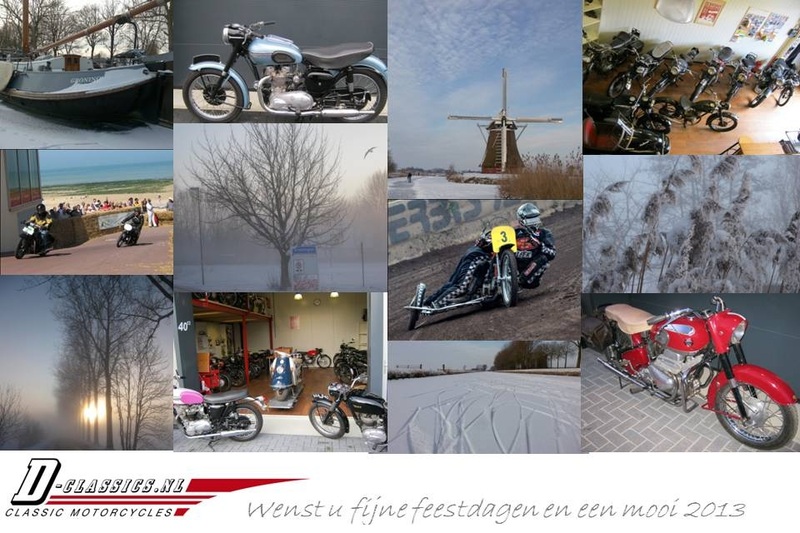 At the Centennial Classic TT in Assen on 18 and 19 September, the wellknown "Vehikel" organisation will host an autojumble on the infield of the circuit. D-Classics will be there! We will bring some nice classics and hope to meet a lot of people. See you there......! We are back from a short but wellearned holyday and looking for new classics. Shortly you will find some new bikes on the site.